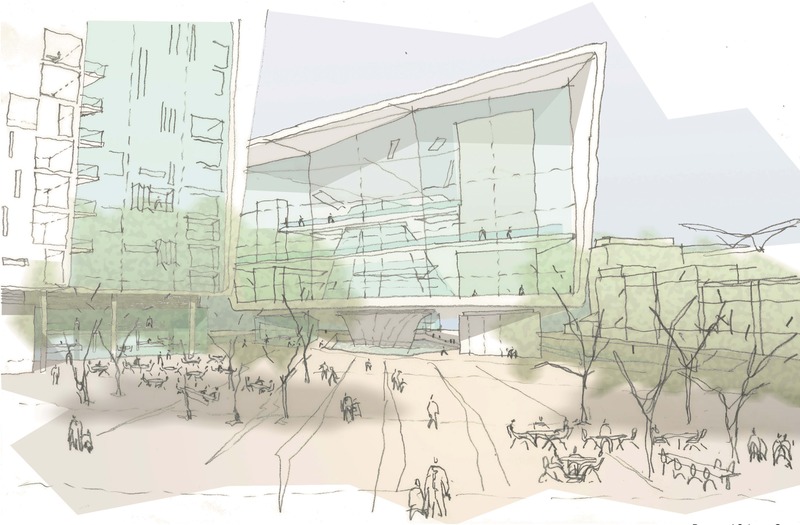 The project was generated from a masterplan study that we undertook to see how Cardiff city and its Bay could be better linked, through the enhancement of existing routes, but equally using a number of spaces and interventions that might describe a cultural narrative that linked aspects of Cardiff’s past, present and future. 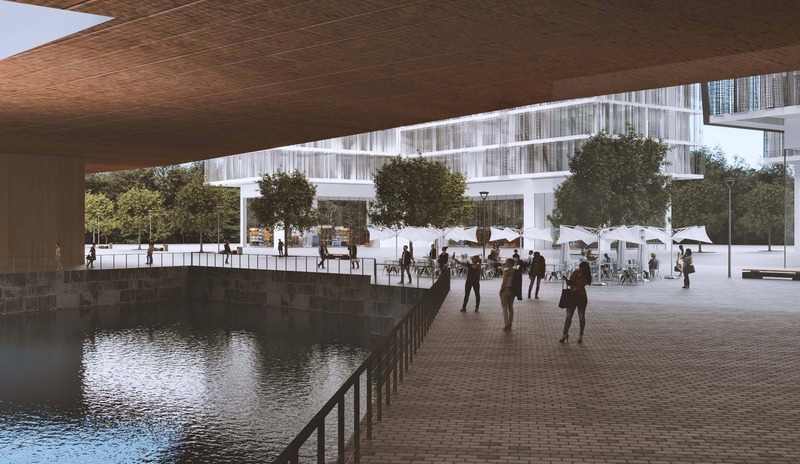 The location for the centre was chosen as one of the historic Graving Docks which laid at the end of one of the new ‘cultural narrative’ routes and the end of a linear park. The walls of these structures are listed, and therefore require specific architectural engagement – essentially one where the walls have to be left intact – untouched. 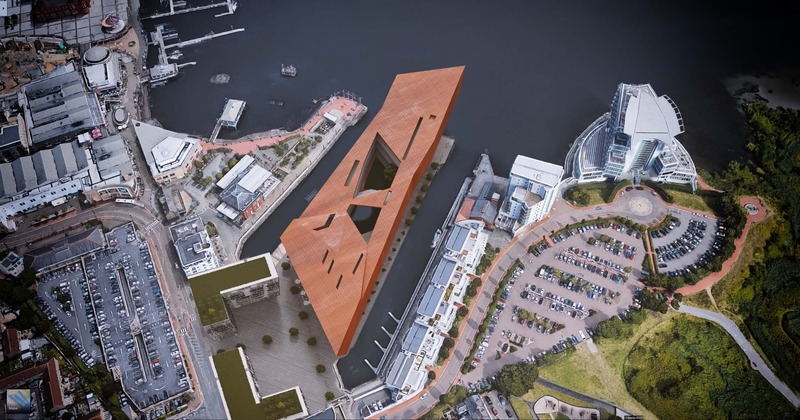 Our architectural concept uses the plan form of the graving dock and raises it 9 metres above the dockside. 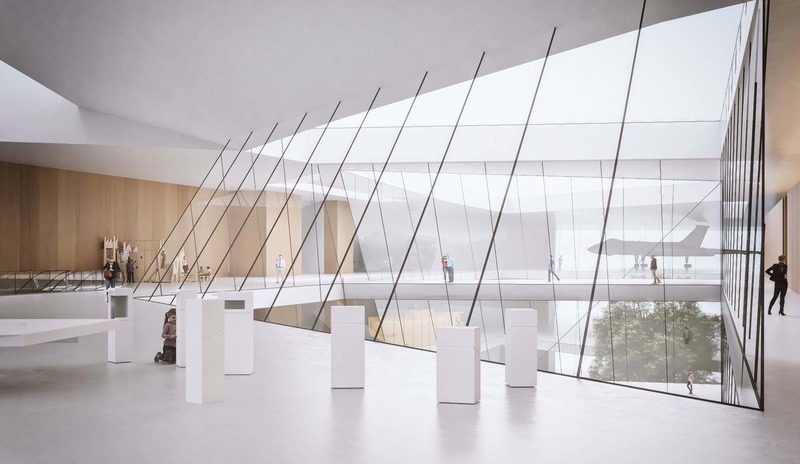 At ground floor an entrance pavilion and service cores conceived as shards, touch the ground. 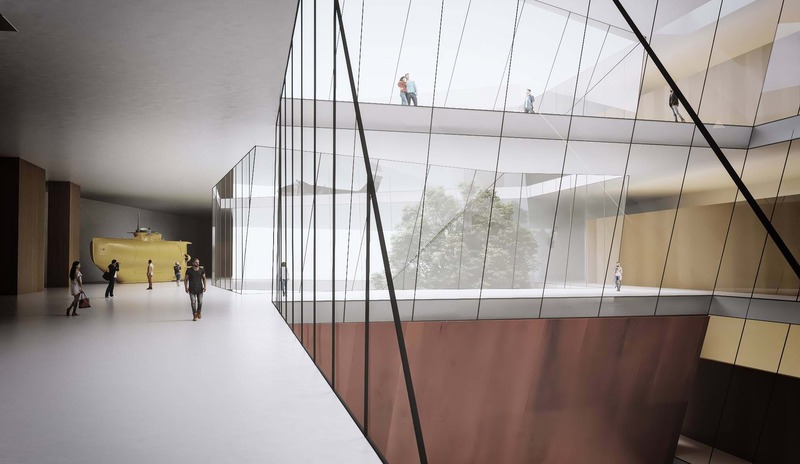 The body of the museum is a simple container, a jewellery box for containing artefacts, exhibits and virtual and augmented reality displays. It is held above the ground by a random and abstract system of columns, all of which are grounded in the base of the dock, leaving the sides untouched. The two ends of the container are entirely transparent. One with a giant TV screen faces onto a new public plaza that will be populated with bars and restaurants with the intent of creating a new cultural quarter in the city. 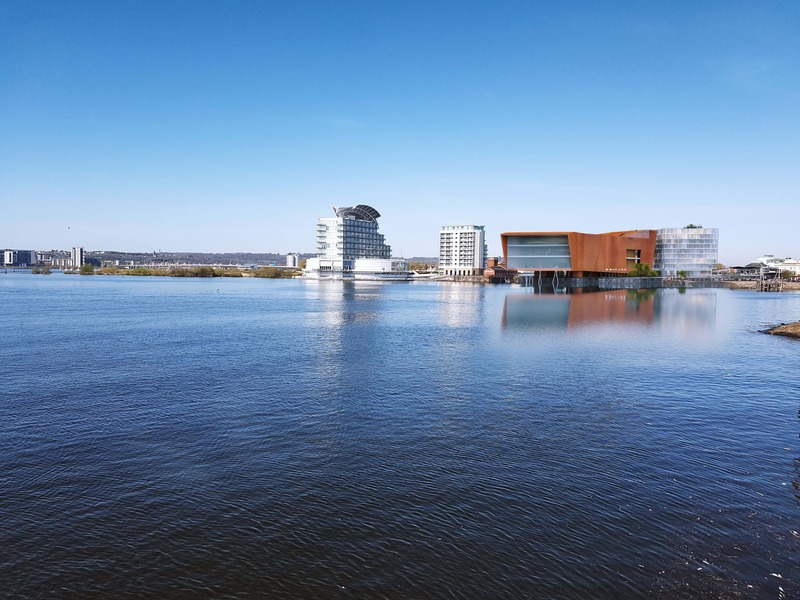 The other with a giant window that looks out over, and frames the body of water that is Cardiff Bay. 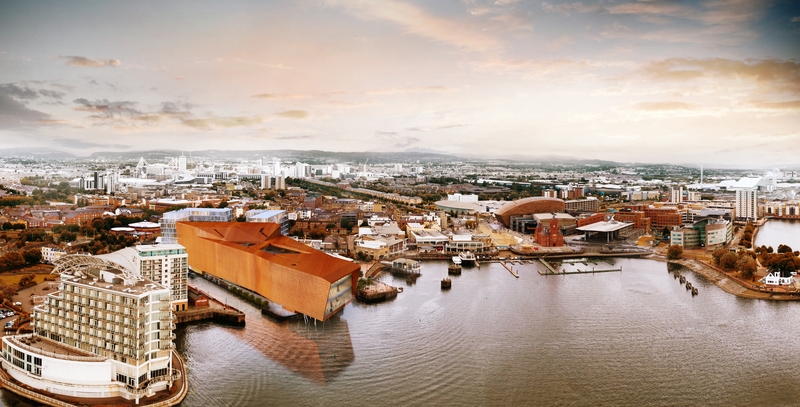 We have designed the building to be sheathed in corten and copper, alluding to the industrial heritage of South-Wales. 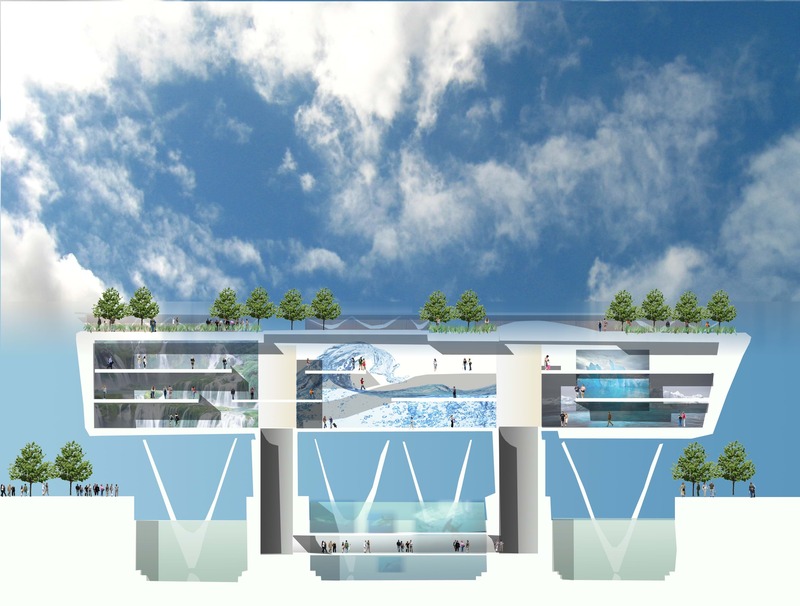 Our idea to include a teaching and lecture space that dips into the water, the ‘Aqua-theatre’ uses screens that slid back to reveal the middle dock as an aquarium and the audience is underwater.